Tooth & Nail | News | Emery Interview and Contest at JamNow.com! Emery Interview and Contest at JamNow.com! 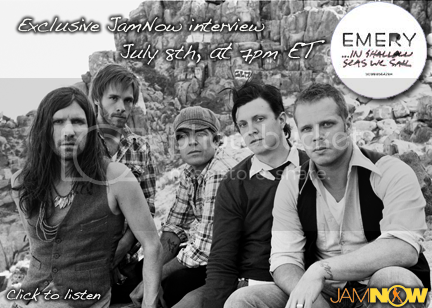 Head over to JamNow.com on July 8th at 7PM EST to check out an Emery interview. The band also has a contest running there to finish a handful of Emery lyrics. One (1) GRANDPRIZE winner will receive a signed Emery poster, special Emery tee shirt, and a FREE copy of Emery’s latest album, …In Shallow Seas We Sail!!! One (1) Runner-up winner will receive a special Emery tee shirt, and a FREE copy of Emery’s latest album, …In Shallow Seas We Sail!!! One (1) Third-prize winner will receive a FREE copy of Emery’s latest album, …In Shallow Seas We Sail! The contest ends July 8th, so head over now!